The statement of cash flows shows the cash moving into a business, called the inflows, and the cash moving out of a business, called the outflows. These are divided into three main categories: Cash From or Used in Operating Activities, Cash From or Used in Investing Activities, and Cash From or Used in Financing Activities. Since cash is real money, there are no assumptions and estimates incorporated in the numbers. Cash coming in is a positive number, cash going out is a negative one, and net cash is simply the sum of the two. Below is a sample cash flow statement, shown in millions. Cash From or Used in Operating Activities, can also be called cash provided by or used for operating activities. This includes all the cash flow related to the actual operations of the business. It includes cash from customers paying their bills, cash the company sends out to pay their bills, cash used to pay salaries, landlord, utilities, and all other activities to keep the business open. Cash From or Used in Investing Activities is all of the investing activities made by the business, not the owners. A key item in this section is capital investments, the purchase of assets for the company. If the company buys (or sells) a truck or a machine, the cash it pays out (or receives) shows up on this part of the statement. This section also includes investments in acquisitions or financial securities, and buying or selling a building. Cash From or Used in Financing Activities is all of the financing made by the company. When a company takes out a loan, pays off the loan, buys back its own stock, or pays dividends to its shareholders, or sell more stock those expenditures of cash would appear in this category. There is a lot of useful information in the cash flow statement. 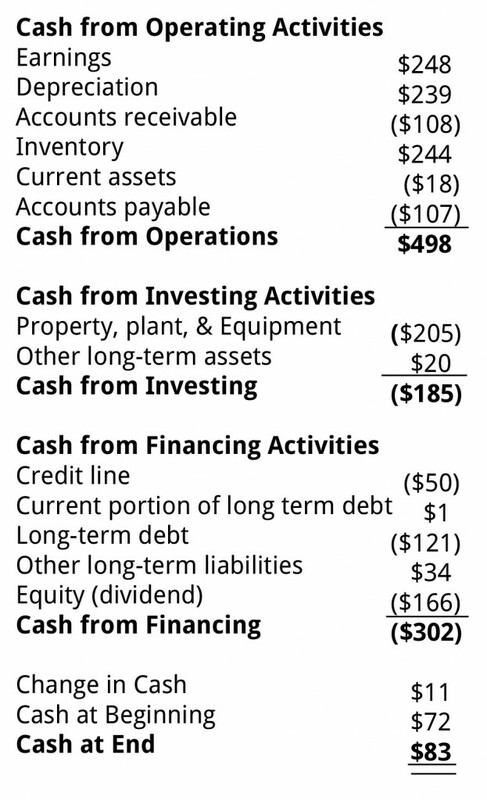 The first section shows operating cash flow, which in many ways is the single most important number indicating the health of a business. Our financial statements training classes go through the key items related to cash flow and the cash flow statements. 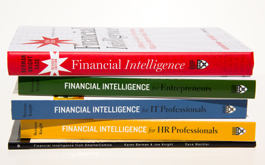 Get a clearer picture of what your company is doing and what free cash flow is. A fantastically engaging session; also very informative & educational. Connects well with audience; humor and stories are effective. Great impactful stories! Fantastic speaker. Excellent class – I learned a lot. I was completely ignorant on this topic and the trainer did an outstanding job. A terrific speaker! Finally, someone has given us simple, easy formulas to make sense of reading, calculating and understanding the financial statements. Thank you! Well done! It’s ratio analysis made easy and applicable; great timing, perfect examples, something everyone can relate to.